Along Samui’s scenic northern coasts lie Baan Capo, a luxurious oceanfront home perfect for beach loving vacation makers. 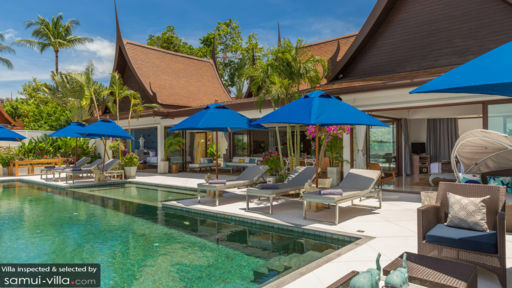 Located in vibrant Bang Rak, the villa puts travellers within close proximity to popular spots such as Fisherman’s Village and Chaweng Beach, as well as an endless array of dining and drinking establishments. Guests here enjoy the perfect combination of being located close to entertainment venues, while staying a serene environment with a high level of privacy. Four commodious bedrooms provide accommodation for eight guests. The two oceanfront master suites open up to the pool deck, and are richly furnished with king-size beds, eye-catching feature walls, built-in headboards with reading lights, TVs, dressing areas and ornate bathrooms. The two remaining triple bedrooms open up to the garden, and feature twin beds, a pull-out bed, TVs, as well as roomy en suite bathrooms equipped with indoor and outdoor shower facilities. Can’t get enough of the tropical sun? Give your skin a sunkissed glow by relaxing at the spacious sun deck. An expansive infinity pool takes center stage here, its sparkling waters beckoning invitingly to sun seekers seeking a respite from the heat. 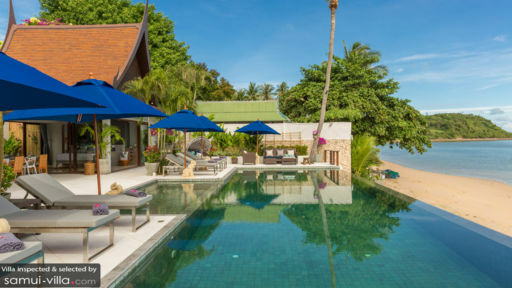 A shallow section in the pool provides a safe play area for the little ones, and a flight of stairs from the pool deck leads guests to a secluded and quiet section of Bang Rak Beach. Step past the sliding doors from the pool deck, and you’ll find yourself in a lush and modern living area. The plush furniture, wood finishings and neutral hues of the interiors create a soothing sight for the eyes. An open-plan kitchen, featuring top-of-the-line equipment, provides a capacious area for culinary enthusiasts to gather for fun-filled cooking sessions. Villa Baan Capo is a full-service property with housekeeping services, security services and a daily breakfast service. A baby cot is available for use free of charge. Amenities available at additional cost include airport transfers and kayak rental. 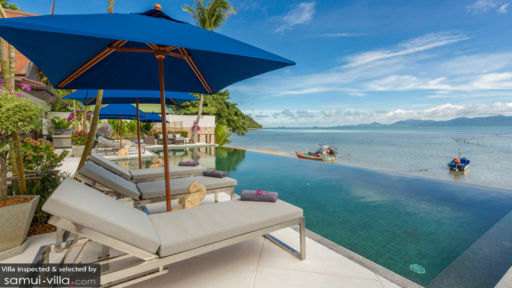 Baan Capo enjoys a prime beachfront location along Bang Rak Beach in North Samui. Often referred to as Big Buddha Beach (you’re just seven minutes’ drive from the iconic Big Buddha Temple! ), the coast stretches out from Plai Laem to Bophut Beach. The location is ideal for holidaymakers looking to stay close to Chaweng and Fisherman’s Village, but prefer a quieter beach ambience. Take your pick from a wide-ranging array of restaurants, beach bars and cafes. La Côte de Bœuf Koh Samui offers a great ambience and mouthwatering French fare, Supattra Thai Dining is known for its scenic surroundings and Thai dishes, Salefino dishes out some of the best Mediterranean fare on the island and 9gems Lounge & Restaurant is our go-to venue for a fine dining experience. There’s also the option of enjoying an in-villa dining experience at Baan Capo - just let your villa manager know, and the details will be taken care of. Fisherman’s Village, located a four-minute drive from Baan Capo offers myriad shopping and dining options. The temple complex of Wat Plai Laem is just a skip away from the Big Buddha Temple, and absolutely worth a visit for its colourful architecture and striking 18-arm Guanyin statue. Planning an offshore adventure? There are ferry boats departing to Ko Tao from Mae Nam Pier. The ferry rides take about one hour and 45 minutes, and the pier is 20 minutes’ drive from Baan Capo.